The advent of faster, digital data capture and processing has been a boon in astronomy but created a problem of too much data to analyse with too few professional astronomers. In July 2007 University of Oxford based astronomer and BBC Sky at Night presenter Chris Lintott and a team of astronomers from the University of Oxford tackled this enviable problem. Their goal was to detect the positions and classify the morphology of a million galaxies captured from the Sloan Digital Sky Survey (SDSS) in New Mexico, and compare those to their positions in the early universe. This would build a picture of the universal expansion of galaxies in the 13.7 billion years since the Big Bang. The solutions were to crowd source the problem and release this data to the public. The Sloan data sets were made available online for volunteers. Their task: to sort, classify and examine these individual galaxies into distinct types (e.g. disks, ellipticals, mergers, warped and spirals). 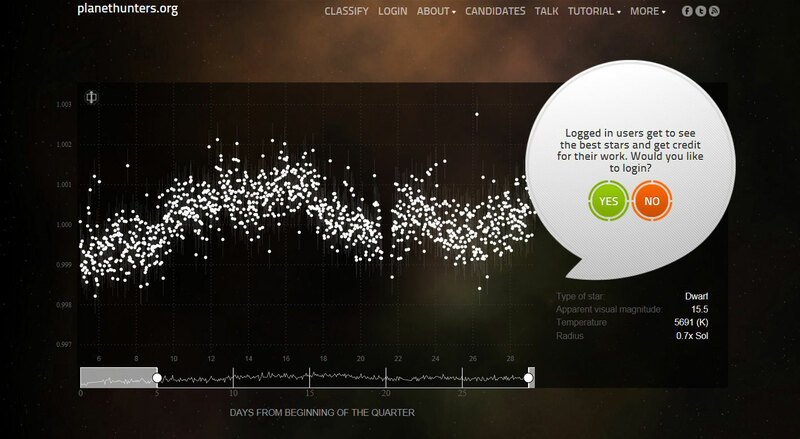 This small online citizen science project was named Galaxy Zoo. Unexpectedly, the overwhelming volunteer response to the project made it incredibly popular, with global input contributing to the wealth of real scientific discoveries through real research. Over 70,000 classifications were received each hour within 24 hours of Galaxy Zoo’s launch, with multiple independent classifications verifying the results. By the project’s first birthday over 150,000 volunteers had contributed to over 50 million classifications. Discovering the strong uptake of interest in citizen science and delivery of scientific results, Lintott and the Galaxy Zoo team saw an untapped reserve of global talent to leverage for use in citizen science projects. The Citizen Science Alliance was born and Zooniverse was created shortly after. Compiling dozens of projects maintained and developed by the Citizen Science Alliance partners, Zooniverse focuses a global network of talented volunteers in sifting through the massive amounts of collected data. Essentially this approach has sped up the rate of scientific discovery and saved hundreds of years of human effort through global cooperation. As a result the benefits assist scientists and researchers in achieving many science goals and discoveries that would otherwise take years with less human analysis and pattern recognition. Furthermore the data analysed from a variety of projects has led to the publication of over 50 scientific papers. Primarily, academic research is the main goal of all Zooniverse projects. As a hugely positive side effect, the enlistment of a global community of citizen science volunteers has, by its very nature, supported STEM outreach for formal and informal education. Today, almost 30 citizen science projects exist in Zooniverse. Uniquely these all need the active participation of human volunteers to complete research tasks across many disciplines such as astronomy, ecology, nature, cell biology, humanities and climate science. As of February 2014 there are over 1 million registered volunteers in the Zooniverse community (see image #1) who are known as “Zooites” working on projects in many languages. There are over 17.7 classifications per minute by volunteers across all these fields showing the vast power of citizen science. The spread of global Zooites is clear. • Galaxy Zoo (Launched 12 July 2007): The latest Galaxy Zoo project. Users view galaxy images and are asked questions to determine its morphology. The current sample includes high red-shift galaxies taken from the Hubble Space Telescope and low red-shift galaxies from the Sloan Digital Sky Survey. • Moon Zoo (Launched 16 February 2009): High resolution Lunar Reconnaissance Orbiter photos of the Moon’s surface are used for detailed crater counts and mapping lunar rocks ages. • Solar Stormwatcher (Launched 21 December 2009): Video imagery data from the twin STEREO spacecraft are used to track the formation and evolution of Coronal Mass Ejections. • The Milky Way Project (Launched 7 December 2010): Spitzer & Herschel Space Telescopes data are used to infer regions where early stages of star formation are occurring. • Planet Hunters (Launched 16 December 2010): Zooites identify extra solar planets from the light curves of star data recorded by the Kepler Space Telescope. • Planet Four (Launched 8 January 2013): Mars Reconnaissance Orbiter images of the surface of Mars are reviewed by volunteers, classifying fans and blotches caused by gas and geysers under CO2 ice. • Radio Galaxy Zoo (Launched 17 December 2013): Zooites identify radio waves of astrophysical jets powered by accretions onto a black hole. • Disk Detective (Launched 30 January 2014): NASA’s WISE telescope data is analysed to identify dusty debris in the Milky Way that indicate stars forming planetary systems. • Sunspotter (Launched 30 January 2013): Zooites examine sunspots and rank them according to complexity, to understand their evolution and how they produce eruptions. A full exploration of each of these projects and others not listed would take up several volumes of this magazine. Instead, here is a preview of two of the citizen science projects above that you can directly contribute to and play a big role in. The long running Galaxy Zoo is now into its fourth incarnation. With a minimum of a septillion stars in the observable universe (that’s approximately 1 followed by 24 zeroes), there will be many more incarnations of this long lived project to come. By having multiple volunteers come to independent conclusions on the type of galaxy observed, a built in cross check enables a high level of confidence in the results. This further allows scientists and researchers to more finely target a test population of spiral galaxies, merger galaxies and other types using the classifications made by volunteer Zooites. 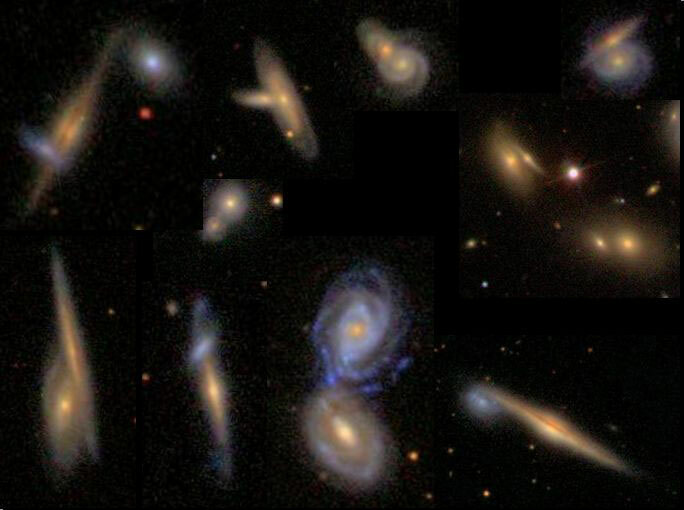 Examples of some of the successfully classified galaxies by Zooites are shown in image #2. Due to the data deluge problem created by modern data collection methods, it would take years for astronomers to sift through the entire set of results but with even as few as 10,000 to 20,000 volunteers giving time to classify galaxies, this process could be finished within months. By more speedily classifying the types of galaxies observed, their shapes tell the tale and the history of each galaxy’s lifetime. Image #3: Tuning the volunteers in via Hubble’s classification of galaxies. The key aspect of Galaxy Zoo (and indeed any Zooniverse project) is that no previous subject matter expertise is needed. Simple tutorials are included on the site guiding volunteers with previously worked examples. Once registered, volunteers can begin accessing the vast amounts of images captured by all the telescopes Galaxy Zoo employs. The vast majority of these are all robotic, as is the subsequent automated processing. 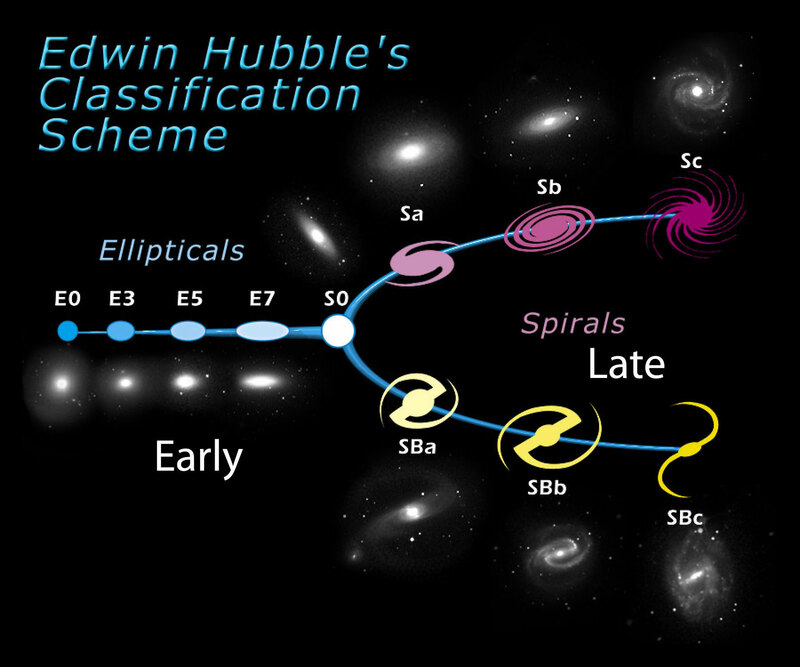 The first Galaxy Zoo referred to astronomer Edwin Hubble’s famous “Tuning Fork Diagram” (as seen in image #3) as a simple guide for galaxy classification. The successful results from the first Galaxy Zoo allowed the founders, astronomers and scientists to win valuable observing time on some of the most powerful telescopes in the world. Galaxy Zoo discoveries have been followed up on the Isaac Newton and William Herschel Telescopes on the island of La Palma in the Canaries, Gemini South in Chile, the WIYN telescope on Kitt Peak, Arizona and the IRAM radio telescope in Spain’s Sierra Nevada. Galaxy Zoo has also won precious observing time and gained data from orbiting space telescopes including Swift, GALEX, Chandra, XMM-Newton Suzaku and perhaps most excitingly the Hubble Space Telescope. Thus, in addition to the original SDSS data there are high chances that volunteers will be looking at remote galaxies and parts of space never seen before by human eyes. The second and third iterations of Galaxy Zoo further extended the range of surveys and what was asked of the Zooite population. More detailed observations and classifications were made; Galaxy Zoo 2’s survey generated over 60 million classifications in 14 months. Colour observations of galaxies were made which deduced recent star formation history. For example blue stars are the “rock stars of the cosmos” as they live fast and die young, burning up their fuel in only 100 million years or so. The third project, Galaxy Zoo: Hubble involved Zooites looking back to the distant past. Drawn from Hubble surveys, the light from galaxies billions of years old was compared to light from galaxies now to determine the footprints that influence their shape and growth (active black holes, mergers, star formations). The current and fourth iteration, Galaxy Zoo: CANDELS adds the most up to date and distant images of our local cosmos to the mountain of available data than ever. 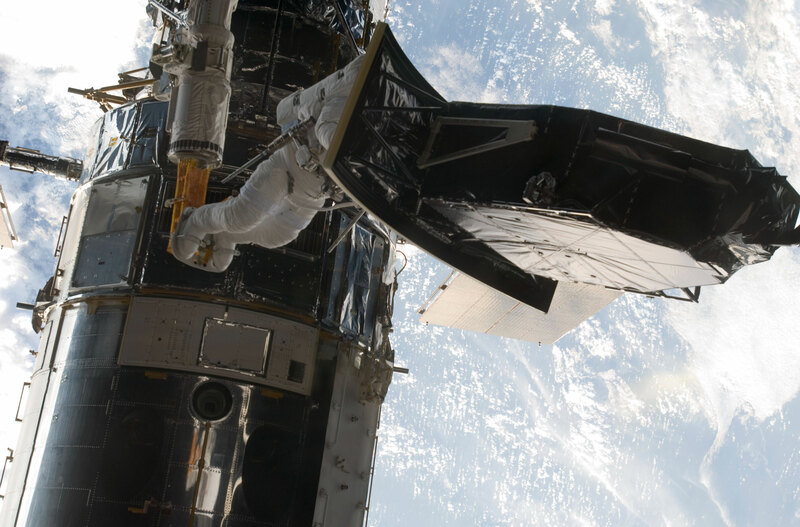 In addition to images from Sloan, Hubble’s newest Widefield Camera 3 installed during the Shuttle Atlantis’ Hubble Servicing Mission 4 (STS-125), has provided data for the CANDELS (Cosmic Assembly Near-Infrared Deep Extragalactic Legacy) survey. Zooites can look back into history farther than before. Installed in 2009, the Widefield Camera 3 (WFC3) is a highly sensitive camera able to peer deeper into the depths of space and through galactic dust at infrared wavelengths. Surveying wider fields of view during the CANDELS program, never before seen pictures of distant galaxies have been obtained. These are far older and more distant than anything seen before. The infra-red images are very different from those taken in the visible light spectrum showing distinctive hidden structures of these galaxies (see image #6). However there are so many pictures available from the CANDELS Survey that Zooites have been called upon again for their help in closely inspecting and classifying them. The advantages of global citizen science outreach can be leveraged again with built in independent cross checks in classifying newly discovered and far distant galaxies. The Zooite community is instrumental in adding to our sum knowledge of the observable universe. Serendipitous and unexpected discoveries lie at the heart of each Galaxy Zoo project. Undoubtedly one of the most surprising and now famous discoveries made in recent years was by a volunteer citizen scientist and classifier, a Dutch school teacher called Hanny Van Arkel. Going beyond the obvious classifications that would have been made by an automated computer programme, Ms Van Arkel spied an unknown object below her target classified galaxy IC2497. 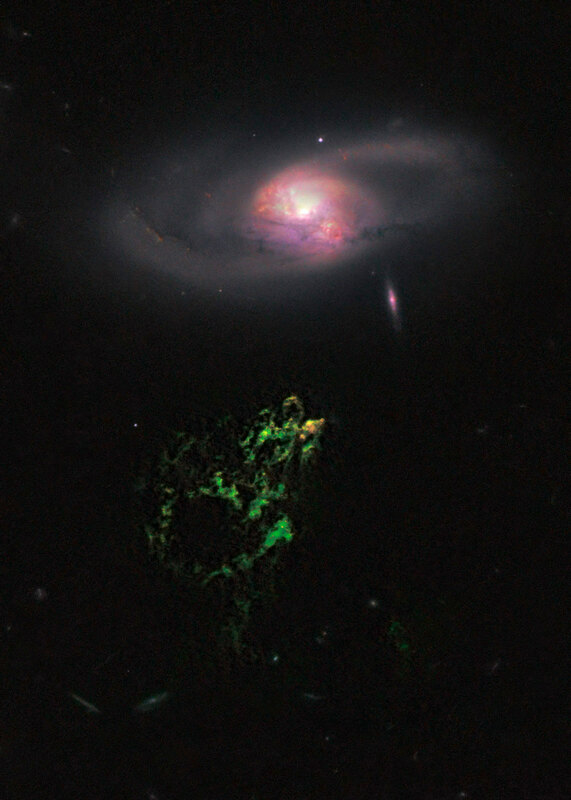 She alerted the Galaxy Zoo team to this discovery, now named “Hanny’s Voorwerp”, and they immediately began to observe this mysterious green object with other colleagues and even employed the Hubble Space Telescope itself (see image #7). The conclusion was that this object is an intensely hot cloud of gas of around 50 thousand degrees Kelvin but rather puzzlingly with very few stars. The hottest stars are very young, probably only a few million years old and lie at the top most and brightest part of the cloud, closest to IC2497. Coincidentally this part of the “voorwerp” or green cloud lies on the trajectory of outflowing gas from IC2497 seen by radio telescopes, so it has been theorised that the star formation in the cloud has been from the interaction of outflowing gases from IC2497 and Hanny’s Voorwerp too. But what of the cloud itself? Data from Hubble has been analysed and suggest a traumatic merger of two or more galaxies formed IC2497 perhaps a billion years before our current view. Out of this, a colossal tail of gas stretched a million light years around IC2497. During this time material rapidly accreted around the new galaxy’s central black hole, enough to form a quasar. This illuminated and ionized the gas creating the Voorwerp cloud. A million years ago, it blew the material adrift as the galaxy core began to fade. The Voorwerp is now a castoff, a ghostly survivor of the past. This story illustrates the power of outreach and citizen science. One person’s serendipitous discovery has directed the attention of world astronomers, scientists and marshalled their tools to examine an object that would otherwise have been missed if we relied solely on computers. The community of Zooites has many more discoveries to be found. This global community of citizen scientists can connect with the project team leaders on their blog (http://blog.galaxyzoo.org/), in Google + Hangouts and Twitter (@galaxyzoo). There is also a Galaxy Zoo forum available for everyone to discuss any and all topics (www.galaxyzooforum.org/). Talk Galaxy Zoo is another place for Zooites to gather share and discuss their data (http://talk.galaxyzoo.org/). More universal mysteries than we know are being gathered, more questions are being asked about the history and evolution of galaxies and the stars within. You could be one of those million or so volunteers helping and find the answers and solve mysteries as old as the cosmos itself. 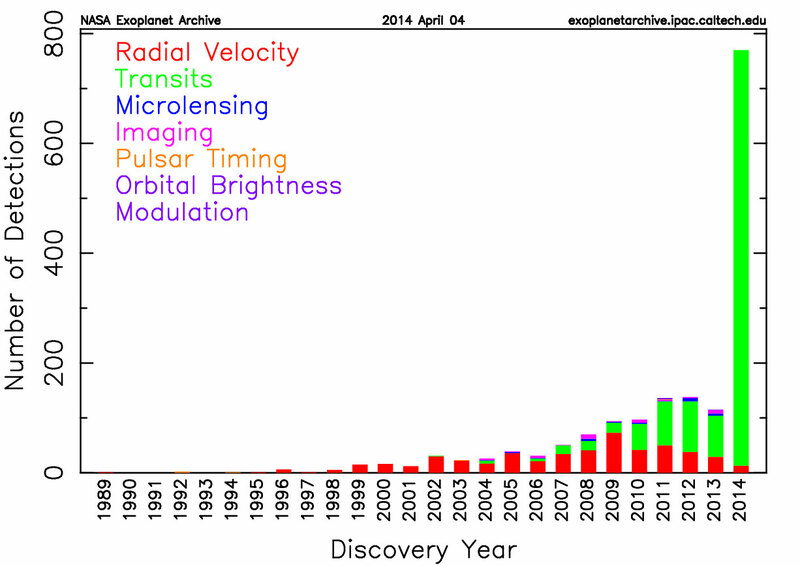 Perhaps the most exciting and fast growing field in the space sciences is that of exoplanetology. This is the search for worlds other than the eight in our own solar system (sorry Pluto! ), orbiting distant stars. This interdisciplinary field mixes astrobiology, astrophysics, astronomy, planetology, geochemistry, astrochemistry and astrogeology in the effort to find so called “exoplanets”. Multiple planet hunting and detection methods have been developed and refined, and these are listed in image #9. This image lists the multiple detection methods (top left) and shows how the transit method has greatly increased the number of detections – far right bar. 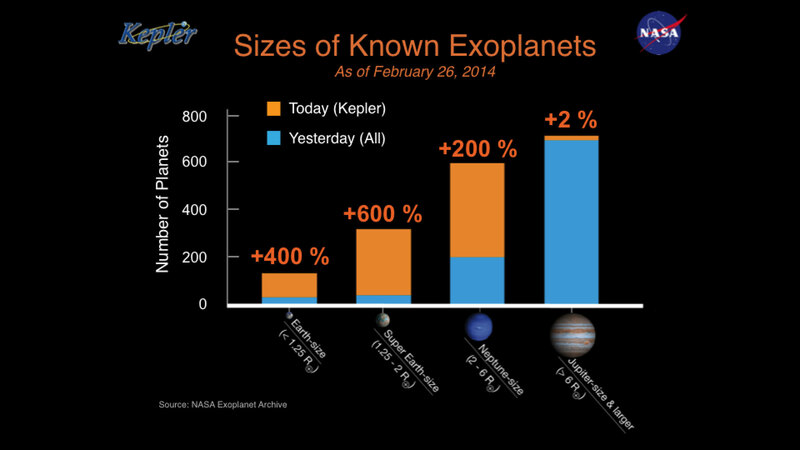 The “transit method” has recently contributed greatly to the rate of exoplanet discoveries as seen during the “Kepler Planet Bonanza” announcement in February. As of May 2014, NASA’s Exoplanet Archive reports there are 1,713 confirmed planets. 443 star systems have multiple planets. The Kepler Space Telescope has 3,845 candidates and 962 confirmed exoplanets making it responsible for 56% of all confirmed discoveries to date. Most excitingly there are 21,267,575 Transit Survey Light Curves. These are the results of exoplanet searches by astronomers via photometric transits of potential planets around host stars. The number of detections by this “transit method” has exploded in the first quarter of 2014 as seen in images #8 and #9. This has vastly outstripped the combined discovery rates of the last 25 years. The inferred conclusion means that there are billions of worlds in our own galaxy, many of which could be capable of supporting life, and just perhaps many where life may have developed just as it has done on Earth. Astronomers dating back to antiquity have long held this view. Extending this supposition further, the search for extra-terrestrial intelligence is another related and attractive field. Intelligence seeks out intelligence. The Kepler Space Telescope was launched in March 2009 to look for exoplanets by using the transit method. Kepler stares at the Cygnus constellation in its Field of View every thirty minutes looking for such transiting planets that slightly dim their parent star’s starlight, as viewed by the space telescope. Smaller planets similar to Earth’s size will dim their parent star’s brightness only slightly. Larger planets also known as “Super Jupiters” will also dim their parent’s star’s brightness but not as much as a smaller Earth size planet would. These time series “snapshots” of changing brightness in these stars are called “light curves” and data for over 150,000 stars is sent to Earth regularly. 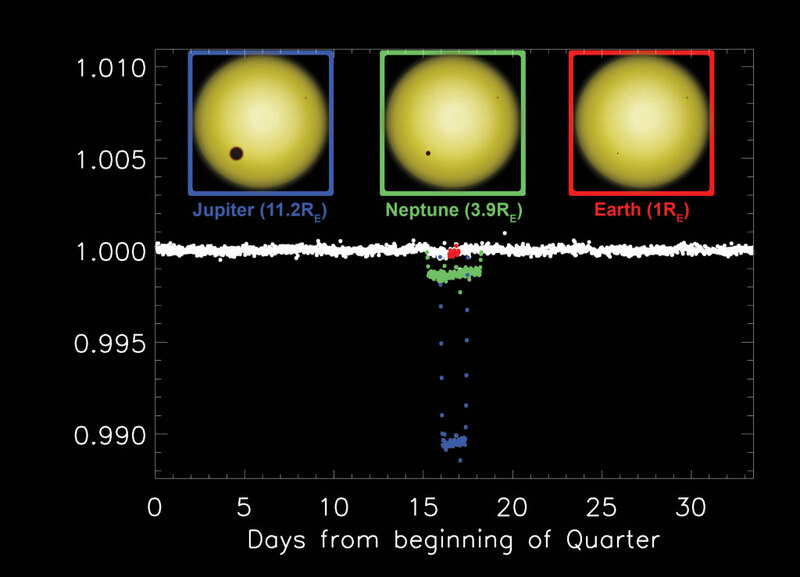 The light curves provided on the Planet Hunters site are publicly available from the Kepler mission. Clearly, the huge amounts of precise data coming from Kepler have awed astronomers and needs to be analysed. Rooms full of super computers could do the job efficiently and quickly, but limited by their programming, can also miss the non-standard signs of an exoplanet or its cosmic footprints. Building on the success of Galaxy Zoo, the talent for a large global resource of human pattern recognition was recognised once more. A new Zooniverse project, Planet Hunters was conceived in collaboration with Yale University. A simulation of a light curve is shown in image #10. This uses a star about the same size as our Sun and different sizes of planets that pass in front of that star. The distributions of white dots represent uninterrupted starlight, as if no planets were transiting in front of that star. However, what would happen if a planet the size of Jupiter would pass in front of that star? The light would noticeably dip for the period that planet was in front of that star, as seen by the dip of the blue dots over a day and a half of observation. This is shown to scale as a Jupiter size planet 11.2 times Earth’s diameter and a tenth the diameter of the Sun. A Neptune sized planet, 3.9 times the radius of Earth, would still block some starlight but not as much as represented by the distribution of green dots. An Earth size planet would decrease the starlight by a fraction of an amount as seen by the distribution of red dots. This is an imperceptible difference to the untrained eye and less sensitive telescopes, but with the advent of Kepler and refined data sifting methods, finding near Earth sized worlds is becoming more frequent. You can also simulate this transit method at home by taking different sized balls and passing them in front of a lit bulb (but wear sunglasses!). The light emitted from the bulb will dip by varying amounts according to the size of the ball passing in front of it and the length of time the ball takes to pass in front of the bulb. Human pattern recognition is being relied upon to spot those patterns in the Kepler data that have been missed by the computers back on Earth. Firstly volunteers are being asked to check for data offsets that look like errors that could be corrected. Secondly, volunteers can check for variability in star data, i.e. if a star’s data looks scattered but constant, or if there are cyclical variations in the star. Lastly, volunteers can highlight any “transit events” they have found in the Kepler data which will look like low points or a low spike in a data set. As a registered volunteer citizen scientist you can corroborate observations along with other volunteers and claim credit for your own discoveries on Planet Hunters (see image #11). Already we have begun to see a large increase in the rate of discovery of worlds closer to our own solar system, hence the need for a united Earth of citizen scientists. The race is on between man and machine. This is a great experiment for an interconnected human super computer of voluntary citizen scientists versus the interconnected machine super computers. The goal is to see which side will find the most exoplanets. Planet hunting volunteer citizen scientists can interact and share ideas at Planet Hunters Talk (http://talk.planethunters.org/). Actively involving volunteer citizen scientists in real research will enhance our knowledge of the universe and our place in it. The ultimate prize will be to find that one elusive exoplanet; Earth sized, rocky, in its parent’s star’s habitable zone, with the right atmospheric conditions and the signatures of liquid water. Could life evolve there? The age old question “are we alone?” has never been more ready for an answer. Perhaps a volunteer citizen scientist, a Zooite will help find that answer. Using the Kepler Space Telescope data NASA announced the discovery of the first Earth sized exoplanet “Kepler-186f” 500 light years from Earth in its parent M dwarf star’s Habitable Zone where liquid water could exist on its surface. Previous research suggests this world is likely to be rocky but we have yet to determine its mass, density, the signatures of liquid water and its atmosphere. Perhaps Kepler’s successors, like the James Webb Space Telescope, can uncover this. This is a remarkable scientific breakthrough and it brings us even closer to the ultimate prize and answer for that age old question. Yet more strange new worlds await our discovery and exploration. Students, teachers, in fact everyone and anyone can become a volunteer citizen scientist and participate in any Zooniverse project. Image #12: Classes for the curious minded at the www.zooteach.org. As an educational outreach tool Zooniverse projects engage with a wide population across all age ranges and encourage meaningful science research. Zoo Teach (www.zooteach.org/) is a tool for educators to share lessons that complement the Zooniverse projects in the classroom. 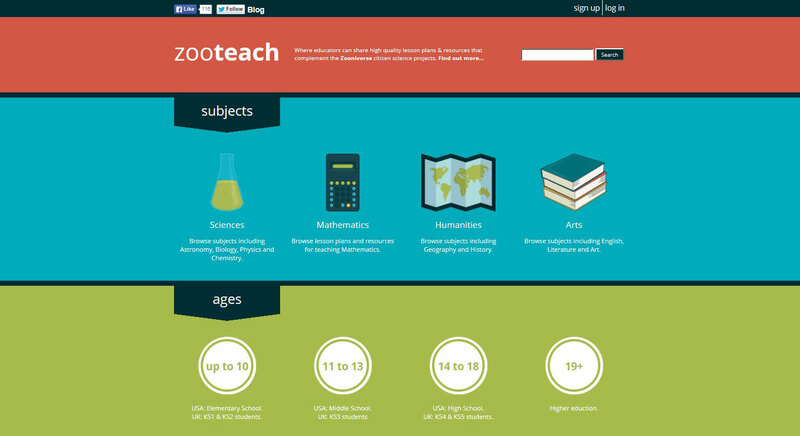 Searches can be done by age range, subject and recent additions of lessons and resources as seen in image #12. Galaxy Zoo is available to educators and students via an interactive tool called Navigator (www.galaxyzoo.org/#/navigator/home) where groups can classify galaxies, compare and investigate their characteristics. Planet Hunters also has well developed set of tutorials and guides at www.planethunters.org/site_guide. Humans have always been curious explorers. We have searched for new sustenance, new lands, crossed oceans and the void of space in search of new cultures and knowledge. Today this curious exploration gene continues to thrive as we search for knowledge to give insight into our existence, whether it is on the ocean floor, on Earth or among the stars. While some of the above quests show the exciting projects available for you to participate in, this is just the tip of the iceberg. There is a whole universe – a “zooniverse” of discoveries out there waiting for you to find. All you have to do is take that first step on the journey.